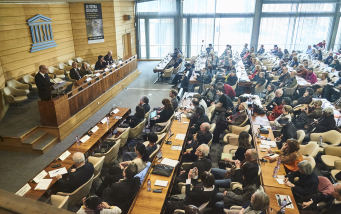 From April 2 to 10, 2016, “Buddhist Sūtras: A universal spiritual heritage―manuscripts and iconography of the Lotus Sūtra” exhibition was held at UNESCO Headquarters in Paris. 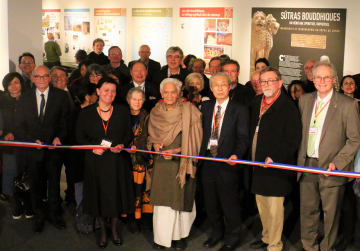 The exhibition was organized by the Soka Cultural Association in France, and supported by the Institute of Oriental Manuscripts, Russian Academy of Sciences (IOM RAS), The International Academy of Indian Culture, and the Dunhuang Academy China. 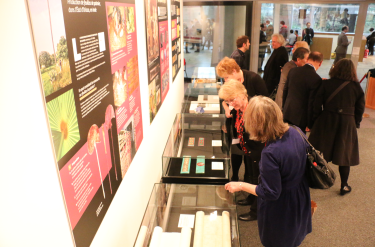 The exhibition was supervised and created by the Institute of Oriental Philosophy and supported by the Institute of Buddhist Studies in France. Through the panels and written materials, the exhibition introduced the history of the dissemination of Buddhist teachings and the footsteps of predecessors who dedicated their lives to spreading the message of Buddhism. It also featured 26 original manuscripts from IOM RAS, including the Gandhari manuscript of the Dhamapada from the 1st and 2nd centuries, and the Sogdian manuscript of the Suka-sutra from the 7th and 8th centuries. The Sanskrit Lotus Sutra Manuscript from IOM RAS, which is also known as the Petrovsky manuscript, recognized as one of the ‘diamonds’ of the world’s largest and most valuable Russian collections, was also on display. It first appeared at the exhibition “Lotus Sutra and Its World: Buddhist Manuscripts of the Great Silk Road” held by the IOP in 1998. Dr. I. F. Popova, director of IOM RAS, remarked that the original manuscripts, a valuable heritage of humanity, should be shared widely; not only among intellectuals and experts, but also among the general public. At the opening ceremony, distinguished guests, including Prof. Lokesh Chandra, director of the International Academy of Indian Culture, Dr. I. F. Popova, Mr. Dominique Trotignon, director of the Institute of Buddhist Studies, Mr. Jean-Claude Gaubert, president of the Soka Cultural Association in France, and Dr. Yoichi Kawada, director of the IOP, participated in the ribbon-cutting ceremony. The exhibition attracted some 7,300 visitors, including Minister Smriti Irani, Minister of Human Resource Development in the Government of India, and UNESCO officials from several countries.